I am trying to complete my Eagle project. I am building benches for the veranda in front of the L&N STEM Academy, a fairly new public high school located in the historic L&N Station and the Butcher Shop on World's Fair Park. The benches will be anchored to the ground and attached to each other in groups of four, forming a square around one of the trees. The square will be six feet to a side. I've consulted with a carpenter and he has assured me of the structural stability of the benches. 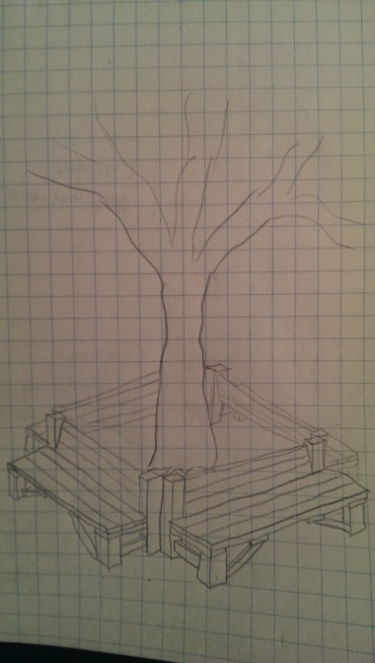 A picture of a sketch of the benches is shown. The STEM Academy resides in buildings that were not designed to house a school. There is no auditorium and no gymnasium. The only place for a large gathering of people is outside on the veranda. Sadly, there is no seating there. Outside groups also use the L&N facilities for meetings and events. Ceremonies at the Veteran's Memorial located directly behind the school utilize the L&N outdoor space. The cost for a set of four benches to go around one tree is roughly $150. I would like to build two sets of four benches if I can find the funds. Hence, I am begging for any donations that individuals can give. Any aid given is going directly to a public school and the Knoxville community that uses the space. I guarantee these benches will be used and appreciated. If you would like to participate in the physical construction, please contact me for details about the work date.